Guillermo del Toro delivers a tour de force with The Shape of Water, a film that is part fairy tale, part romance, and part social commentary. If the trailers hint at inspiration from the 1950s cult classic Creature from the Black Lagoon, that’s because there was. But the movie is modern in virtually every aspect of del Toro’s storytelling, direction, visualization, screenplay, and setting. Set in the midst of the Cold War in 1962, an amphibious gilled-humanoid (Doug Jones, Mimic, Hellboy, Pan’s Labrynth) is discovered, trapped, and brought back to a secret scientific facility in Baltimore, Maryland. Colonel Richard Strickland (Michael Shannon, 99 Homes, Nocturnal Animals, 8 Mile) is the lead on a military team studying the creature and part of the so-called Space Race. (The U.S. effort to catch up to the Soviet Union in orbital and space technology.) Strickland’s methods are harsh and brutal, usually administered using an electrified nightstick (although the purposes of the experiments and role of the electronic prod are not clear). Strickland’s tactics disturb Bob Hoffstetler (Michael Stuhlbarg, The Post, Call Me By My Name, Dr. Strange), a scientist on the team who believes the creature is intelligent and capable of communication. But the story really revolves around Elisa (Sally Hawkins, Maudie, Blue Jasmine, Happy-Go-Lucky), a mute who works on the utility’s janitorial crew with her friend and co-worker Zelda (Octavia Spencer, Hidden Figures, The Help, Gifted). Elisa communicates through sign language to her gay next door neighbor Giles (Richard Jenkins, Bone Tomahawk, The Visitor) and Zelda at work. The two quickly realize that Strickland’s methods are brutalizing the creature. When they are summoned into the holding room to clean up after a particularly violent episode that severely wounds Strickland, Elisa begins to bond with the amphibian. Eventually, Elisa steals her way into the room on her lunch breaks, and their bond evolves into a friendship. As corny as the relationship sounds, it works in the movie. Del Toro’s is careful to develop Elisa’s backstory and pace the story to make the relationship believable. Strickland’s military superiors order him to start running live surgical experiments on the creature to better understand how its body operates. This horrifies Elisa. Hoffstetler resists the military experimentation but is powerless to stop it. But the scientist is also a Soviet spy. Moscow orders the creature killed before the Americans have an opportunity to learn from it. Hoffstetler resolves to kill the amphibian before Strickland can begin the operation. Elisa learns of the American plan and plots to escape with the creature with the help of Giles. After Zelda and Hoffstetler stumble on her plot, Zelda chips into to protect her friend while Hoffstetler sees an opportunity to avoid the destruction of intelligent life. The story, and the relationship between Elisa and the gilled-humanoid, deepens as she hides it in her run-down Baltimore apartment with the help of Giles and support of Zelda. 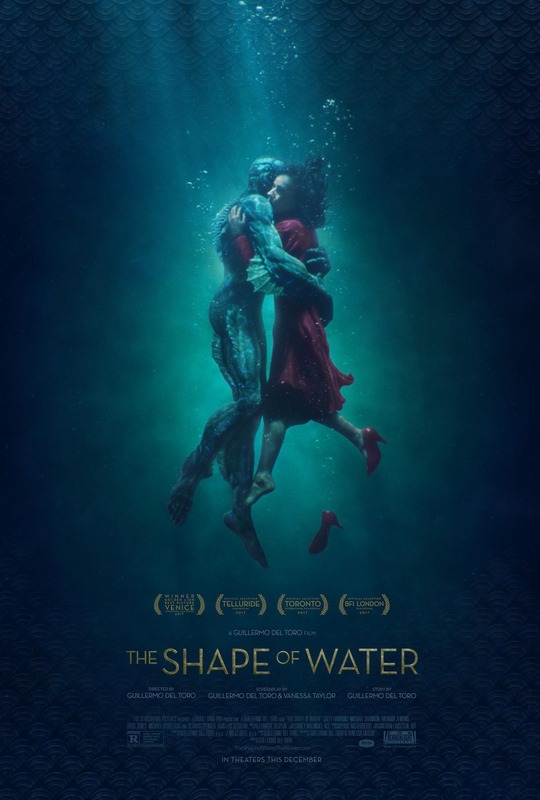 Del Toro’s screenplay masterfully pays homage to 1950s mass entertainment culture that inspired the kernel that emerges as The Shape of Water. But he also brings into the movie into its own as a modern-day fantasy and fairy tale. The story hinges around the bonding between outsiders: Lisa, the mute everyone underestimates and ignores; Giles, the middle-aged, struggling gay artist who has been shunned by society and his workplace; Zelda, the African-American woman whose very existence is questioned by society; and, of course the most obvious, the creature whose value no one recognizes except Elisa. Del Toro adds depth by extending the outsider metaphor beyond the heroes, weaving Strickland’s brutality into his personal desire and identity as a successful military officer. He rejection by his superior, however, drives him to increasingly desperate and violent tactics with tragic outcomes. The Shape of Water’s production values are top notch and refreshingly grounded, relying on visual and practical effects rather that digitized special effects. The result is an aesthetic and visualization that fits neatly into the mood, tone, and period of the movie. The Shape of Water may well be destined to become a modern classic as del Toro more fully establishes himself as one of this generation’s auteur filmmakers. On my rubric, The Shape of Water scored a 9.25 (A-), and I would put it on my “must see” list for 2016 for movie enthusiasts. Rotten Tomatoes ratings can be found here. 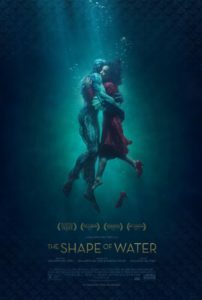 This entry was posted in Film making, Film Reviews, Films and tagged film review, Guillermo del Toro, movie review, The Shape of Water on February 3, 2018 by SR Staley.